How Does Humidity Affect My Orchid? 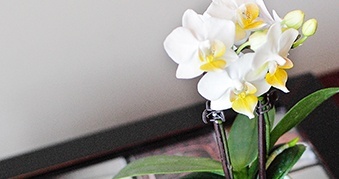 Phalaenopsis orchids certainly are a hardy variety, which is what makes them so popular among those new to orchid care, but the beautiful plants need to live in a specific type of environment to thrive. We’ve instructed on the importance of lighting and room temperature, but did you know humidity plays a role in your orchid’s well being too? 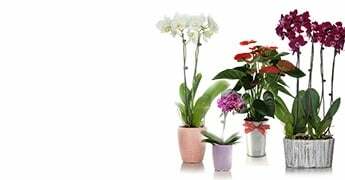 Phalaenopsis orchids originated in the tropics, therefore, they perform best when room humidity is relatively high, between 55% and 75%. While seldom a problem in climate-controlled homes and offices, low humidity is a common problem in areas with dry or desert climates. 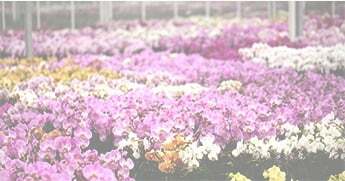 For orchid owners who live in the country’s more temperate regions, low humidity most often occurs when plunging outdoor temperatures and forced-air heat combine to dry out indoor air. 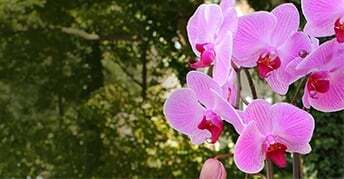 Wrinkled leaves: You’re orchid is most likely suffering from low humidity. Bud blast: Bud blast, or deformed buds, is most often caused by sudden temperature or environmental changes. 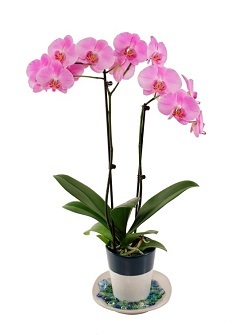 Phalaenopsis orchids thrive when daytime temperatures are between 65 and 80 degrees F. and nighttime temperatures between 60 and 70 degrees F.
To increase humidity levels around your orchid, you can mist the leaves of your orchid or put a shallow tray of decorative rocks and water underneath your orchid for a more ornate look. To create this look, take a shallow tray, put a layer of decorative rocks or beads in it and add some water to the tray. Set your orchid on top of the rocks. You will need to check the water levels of the tray every so often to make sure it’s full. This approach is less maintenance than misting the leaves every day, but both ways are effective. If you continue to experience problems with your orchid, or if you have other orchid care questions, be sure to check out our FAQ section.